The Elo 1590L 15" open-frame LCD touch display complements the Elo expanding family of touch solutions for kiosks, casino and amusement, retail self-service, and industrial floor automation. Featuring a slim design and narrow outside dimensions, the state-of-the art energy-saving LED backlight uses less electricity to operate and generates less heat. This compact touch display is "designed for touch," with proven Elo expertise and reliability built in. The 1590L provides stable "drift-free" operation with outstanding image clarity and light transmission-for accurate touch responses and vivid images. The touchscreen is sealed against dirt, dust and liquids, which simplifies integration into the final enclosure. Long-lasting product availability can be expected as the design and tooling is controlled by Elo specifications. The 1590L is available with a choice of industry-leading touch technologies, in both single touch and multi touch versions. 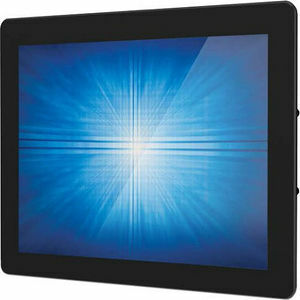 The seamless zero-bezel 15" multi-touch display is available with our latest projected capacitive (PCAP) 2GS (two glass solution) technology that delivers both a ten touch "tablet like" interactive experience along with thru-glass functionality - both modes support single or dual latex gloves as well as cloth gloves. Standard bezel, single-touch display options include AccuTouch® five-wire resistive, IntelliTouch® SAW or SecureTouch® anti-vandal SAW.